Junior five-a-side soccer stars will gather again at the CIFA complex today for more exciting on the field action. In the Under 11 mix the Nikao United are leading followed by Takuvaine, Matavera, Tupapa Baby Pirahnas, Titikaveka Puppies and Raemaru Kanga. The Under 14 girls leading Tupapa Fairies have overwhelmed their pool wining all five matches. The second placing in the points table Matavera Real Deals are a young talented fierce team followed by the skilled Nikao Ice, Baby Bears, Princess Bratz and Titikaveka Wildcats. 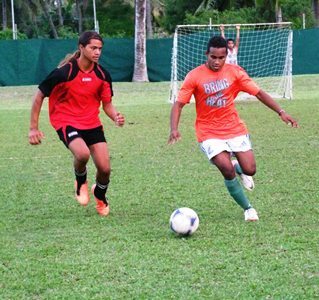 The Under 14 boys highly skilled Nikao Fire have speed and skill leading the point table by three points ahead of Tupapa Pandas and Takuvaine, Raemaru Flyers and Titikaveka Terriers. The talented teams have been playing their hearts out to the cheers and support. All teams will need to play their best with speed, creativity, control and quick thinking to keep their placing on the points table. Come and show your support for our junior teams today as they play the beautiful game of football.